Nairobi, Kenya – 31st August 2017: Many Kenyans are forced to pay a bribe to access key services. According to the East Africa Bribery Index (EABI) 2017, Kenyans would pay a bribe to access Police Services (68.8%), Land (55.1%), Judiciary (48%) and Civil Registration Services (45%). The Index reaffirms that bribery is still a key concern in the region with 83% of Kenyans describing the level of corruption as high compared to Uganda at 81%, Rwanda 61% and Tanzania at 44%. The survey recorded a reduction of bribery incidents across the region from majority of the respondents seeking public services. It however identified the Judiciary, Land and the Police Services as institutions most affected by bribery across the region. Share of ‘National’ Bribe: Bribes paid at the Police accounted for a third of all bribes reported while cumulatively Educational Institutions and the Judiciary accounted for another third. Bribes paid at Tax Services and Huduma Centres accounted for 2% and 0.6% respectively of all bribes paid. There was a 14point decrease in share of bribes paid to the Police. Bribes paid at the Huduma Centres accounted for less than one percent of all the bribes paid. Anti-Corruption Performance of State and Non-State Actors: The government’s commitment to fight corruption was put to question. The President, Office of the Auditor General and the Ethics and AntiCorruption Commission were rated as average while the Judiciary and legislature scored lowly. These findings further reinforce the citizens’ belief that the government is not doing enough to fight corruption. On the other hand, the media and religious institutions’ performance was rated as good while civil society and citizens were rated as average. The East African Bribery Index is a snapshot of corruption in the region. 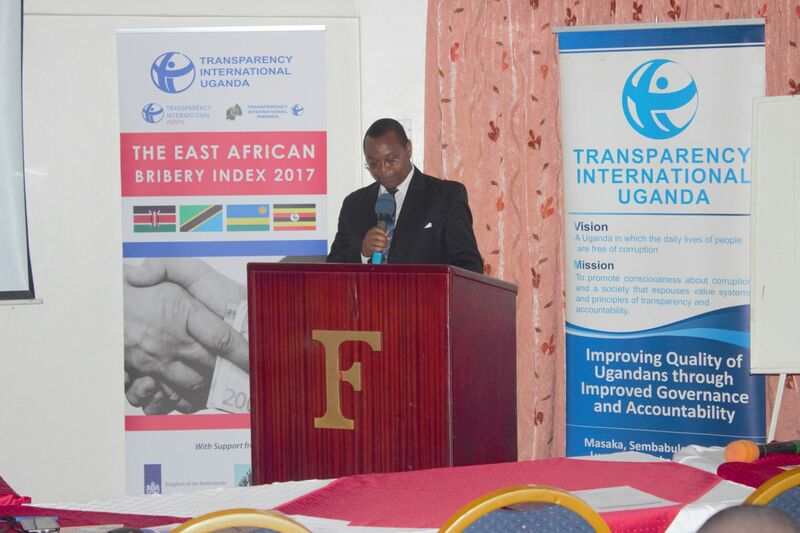 To understand the extent and scope of corruption in an institution, TI national chapters and partners in East Africa can be sought to conduct an institutional integrity study to identify systematic weaknesses that may predispose an institution to corrupt practices. TI national chapters and partners in the five East African countries welcome partnerships with public institutions aimed at comprehensively identifying and strengthening internal systems and procedures to curb corruption. Methodology: The East African Bribery Index 2017 survey was conducted in Burundi, Kenya, Rwanda, Tanzania and Uganda between January and March 2017. Data was collected through face to face interviews with 9,533 respondents in the region including 2,398 respondents in Kenya. The respondents were picked through simple random sampling based on the population size across the various administrative units in each country.